Just a few days left until the Deadline! 10th of January! Polish those 300-word short-short stories and take your chance. Become a part of this wonderful community of writers and storytellers. Take the chance of winning the prize! Give your story a chance to be recognised. Check out the 2018 Calendar from here LISP. LISP judges are looking for strong and unique voices, check out the interviews with the judges on the website. ‘Originality must come from other resources: from one’s own voice, personality, character.’ Luis Pizarro, LISP judge. ‘Given that the story can only be 300 words, I am looking for something beyond the ephemeral, a story that will make an impression.’ James Kirchick, LISP judge. ‘LISP is based on creating a great community and, of course, all the writers who attend the competition will definitely be a part of this network. However, winners are winners, and they will have the greatest advantage. First of all, the prize and publication, and when you win a competition, it means that your pen has been recognised, which is a great feature for any writer. Not only while trying to reach agents or publishers, but also the personal satisfaction is priceless. Especially for young writers, it’s a way to build confidence. As an award winner, I can also say that it helps you to improve. Now you see that you can write things that others appreciate as well, which encourages you to be even bolder.’ Ozge Gozturk, LISP founder. Reflex Fiction Autumn 2017 Winners! You can read Tim’s thoughts on the winning stories here. We’ve also just published the long-list for our Winter 2017 competition and have started publishing stories as we count down to the announcement of the winners at the end of March. 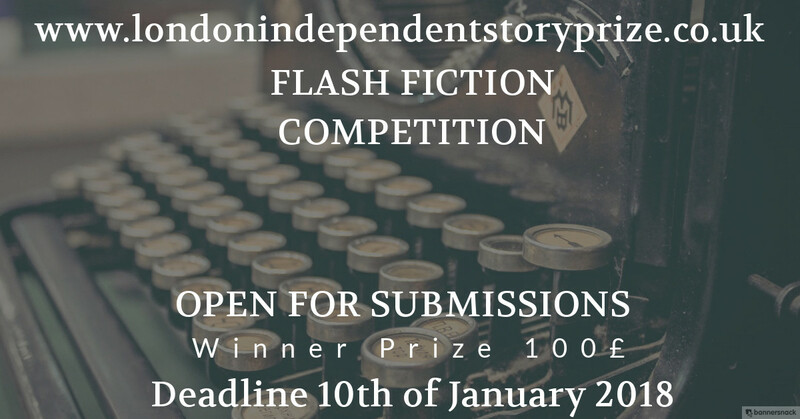 London Independent Story Prize, LISP is holding a writing contest. Their aim is to discover extraordinary artistic approaches to story writing, stories that embrace the diversity of gender and culture whilst being brave and passionate. They are looking for unique and strong voices. BAME, Women, and LGBTQ are especially welcome. They’ll be delighted to read it and you could be in with a chance to win! Follow their Facebook and Twitter @LIStoryPrize for the announcements. Check their amazing judge list from this link. Reflex Fiction Summer 2017 Winners! You can read Vanessa’s thoughts on the winning stories here. We’ve also just published the long-list for our Autumn 2017 competition and have started publishing stories as we count down to the announcement of the winners at the end of December. We had so much fun teaching Write and Edit a Story in the spring that we’ve brought it back again this autumn. Only this time we’re not only dissecting the short story, but also the personal essay. We all have different strengths and weaknesses as writers. For some, getting a first draft down is a necessary torture before the fun of editing begins. For others, editing is the agony after the ecstasy! This two-day course is designed to get you both writing and editing, by combining dedicated creative time with an intensive tour through ways to improve your craft. On day one, we’ll kick off by exploring ways to turn our ideas into full stories, whether we’re writing fiction or creative nonfiction, from getting first words down to finishing a draft. You will then have ample time and space (and tea and cake) to write, in the quiet company of fellow scribblers. On day two, we will work through a series of editing approaches, which you will be able to apply to your own work. Think of these as a series of editorial experiments that will throw new light on plot, style, characterisation, setting, dialogue, openings and endings. We suggest that you bring your draft from the previous day (or another story or essay if you prefer), in multiple copy or on a laptop, so that you can test out approaches even if you choose not to apply all the editing techniques we teach in the session. We’ll discuss the results and share our work if we wish. In the spring both Zoe and Lily shared a very rough draft of their own writing, to be pulled apart by the group, but it was a great learning curve for everyone. So we’ll most likely do this again as well. Eek! You don’t have to come up with an idea on the spot. You might have an idea you’ve been wanting to write, or a piece you have already started. Please bring this with you, to draft on day one. For those who want a new idea, we’ll provide optional idea-generating material to get you going. This course is suitable for both beginners and committed writers. For both those writing fiction and creative nonfiction. Whether you’re dabbling in your first short stories or personal essays, or you’re compiling a short story collection, or writing a memoir, we welcome you. By the end of the course we’ll endeavour to help you have a new draft of a story or essay, and a range of editing skills to help get it into shape. Tutors: This course will be taught by both Lily Dunn and Zoe Gilbert of London Lit Lab. By leading workshops together, we are able to bring two perspectives to everything we teach, and therefore everything is up for discussion! Sharing our differing approaches to writing helps to create a richer learning experience, which we believe benefits everyone who comes on our courses. We have one place on this course available at a 75% discount for a writer who would struggle to pay the full fee. If you, or someone you know, would like to apply for this place, please write to us at info@londonlitlab.co.uk, by 23rd September. In no more than 200 words, please tell us why you would like to come on the course, what you write, and why a discounted place would be valuable to you. We won’t be fact-checking but we really want to give this place to someone who genuinely needs it, so please be honest. Thanks, and we look forward to hearing from you.